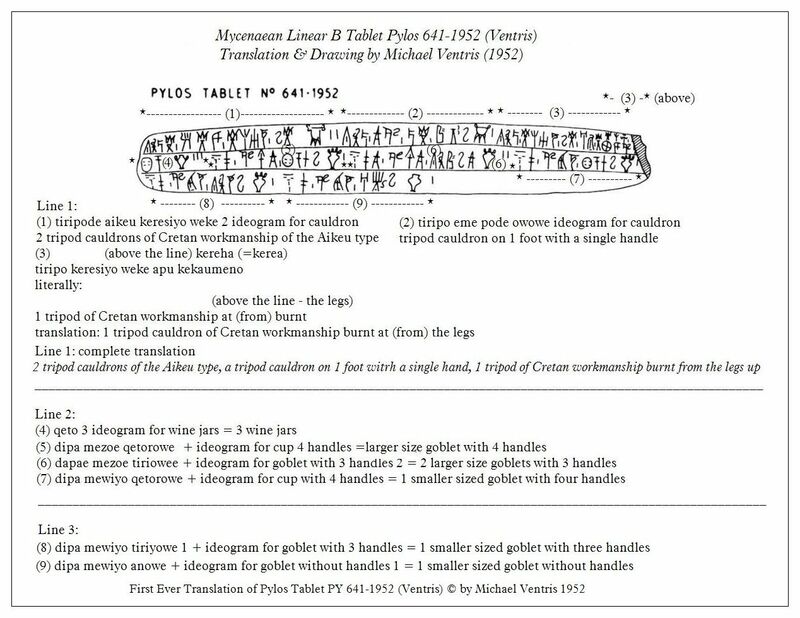 This is the first ever translation of Pylos Tablet PY 641-1952 (Ventris) by Michael Ventris himself, and the first tablet in Mycenaean Linear B ever translated into English. A bit of background is in order. It was actually the archaeologist Carl Blegen, who had just unearthed this tablet along with several others at Pylos in 1951-1952, who was the first person to recognize that it was almost certainly written in Greek, because he correctly translated the very first word as tiripode, which was clearly the Greek word for “tripod”, no matter how archaic the dialect. That dialect we now call Mycenaean Greek, which is so closely related to Arcado-Cypriot Greek, later written in both Linear C and in the archaic Arcado-Cypriot alphabet (ca. 1100 to 400 BCE) as to be its kissing cousin. These two dialects were more closely allied than any other ancient Greek dialects, including the Ionic and Attic, a fact which proves to be of enormous import in any decipherment or translation in either Mycenaean Linear B or Arcado-Cypriot Linear C (or alphabetic). We must keep this fact firmly in mind at all times when translating any tablet in either of these dialects, which are both firmly ensconced in the East Greek class. As for Michael Ventris’ meticulous decipherment of this justly famous tablet in his beautiful handwriting, it still holds its own as one of the finest to this day. The only flaw of any significance was his translation of the word “Aikeu”, which he interpreted as meaning “of the Aikeu type”, for want of any more convincing alternative. But in retrospect we can scarcely blame him for that, as we have nowadays the privilege and the insight to peer back through the looking glass or the mirror, if you like, into the past 63 years ago, to pass judgement on his decipherment, armed as we are with a clearer understanding of the intricacies of Mycenaean Greek and of Linear B. To do so would be paramount to violating the integrity of his decipherment which was the very finest anyone could have come up with in the earliest days of the decipherment of Linear B, of which he was the avowed master par excellence. We shall turn next to two modern translations of the same tablet, one by Rita Roberts of Crete and the other by Gretchen Leonhardt of the U.S.A, holding them up in the mirror of Ventris’ own inimitable decipherment, to see how they both stack up against his own, and against the other. I shall be rating each of the 3 translations on its own merits and demerits on the basis of several strict criteria for decipherment, one of which was recently introduced by Ms. Gretchen Leonhardt herself, a criterion which must stand the test of theoretical validity, as well as measure up to firm empirical evidence, as we shall soon see. Again thanks! Merci encore une fois ! OMG ! I am getting anxious here now Richard. No no no! Please do NOT! I myself went half bonkers just trying to get Michael-s translation right. Not to worry at all. You already know I have given you 96 %. Who could ask for more, eh! So not to worry, we will work this thing out together. You can see NOW that translating the biggie tablets, the difficult ones, IS difficult and sometimes even a pain in the you know what. But that is where the challenge is, where all the fun is and finally, when we DO get it right, where the sense of immense satisfaction comes from. This is NO EASY tablet, by any means. That is why I gave it to you to decipher in the first place. By deciphering this tablet, you set yourself very well indeed for your university level tablets, which will start at about the same level of difficulty, and later on get progressively harder and harder. But enough of that for now. Let us both get through this baby. You have done a superb job, and you know perfectly well I could not have done it myself, because I am not an archaeologist and do not have your insights. Simple as that. Awe ! Thanks Richard. I must say I really enjoyed working out this tablet anyway.